Paya, R., et al. Measuring Resilience in Brazilian Families with Substance Abuse Problems Resilience in Families with Substance Abuse. (2017) J Addict Depend 3(1): 1- 7. © 2017 Paya, R. This is an Open access article distributed under the terms of Creative Commons Attribution 4.0 International License. Gather information on the functions and characteristics of families with substance abusers contributes to explore possible strategies to strengthen and change family behaviors. Investigate family resilience not only eases abroad understanding of familiar system, able of change and cope, but also underlines the need to include specific tools to develop desirable family attributes in the field of clinical and communitarian interventions. The Index of Regenerativity and Adaptation-General (FIRA-G) was developed to investigate dimensions of family functioning, including resilience. This paper aims to evaluate of FIRA-G reliability in a case-control study of 305 families from Sao Paulo with and without substance abuse members. Based on the methodology, there is no clear evidence that FIRA-G scale is a completely reliable instrument to measure components of family resilience, but it has proved valuable to compare differences between groups as the control group (M = 20.8; SD = 11.8) presented lower resilience condition than the alcohol group (M = 29.6; SD = 16). Thus, further studies should be conducted to assess samples living in different social conditions. The presence of addiction is highly stressful for a family’s dynamics. Approximately one in every three alcohol-dependent individuals has a family history of alcoholism, and couples in which one of the spouses is addicted are three times more likely to divorce than are other couples. In addition to previous cases of addiction, other risk factors need to be addressed for families of addicts. Such as the risk of domestic violence, strongly associated with substance abuse problems. According to Zanoti-Jeronymo & Carvalho, children who have witnessed aggression between family members are more likely to develop substance abuse in adulthood than children who have been physically abused. Moreover, addicted parents are more likely to display verbally and physically abusive behavior toward each other and to use aggressive disciplinary practices with their children. To the protective factor framework, gathering information on the family functions, characteristics of the families and risks like violence contributes to the exploration of possible strategies for strengthening and changing family behaviors[5,6]. Investigating family resilience not only facilitates abroad understanding of the family system, which is capable of change and coping, but also underlines the need to include specific tools to develop desirable family attributes in the field of clinical and communitarian interventions. 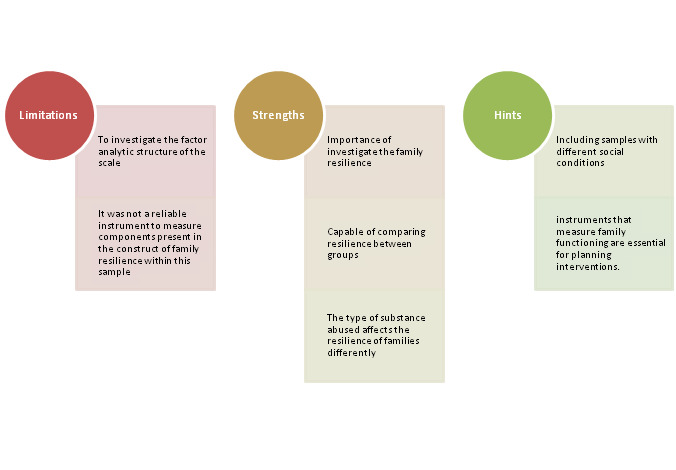 The need to explore protective factors within the family system has led professionals in the field of family substance abuse to investigate the effect of resilience[7,8,9]. Although anecdotal evidence concerning linkages between resilience and substance abuse has been common, the association within the family context is not well documented or understood. Consequently, this association is relatively infrequently perceived in Brazil. Resilience can be defined as the positive behavioral patterns and functional competences that individuals and family units demonstrate under stressful or adverse circumstances. Resilience determines a family´s ability to recover by maintaining its integrity as a unit while ensuring or restoring the well-being of the family members and the family unit. Castleden, McKee, Murray, & Leonardi believes that resilience through loss or potential trauma is more common than is often believed and that there are multiple and sometimes unexpected pathways to resilience. Resilience is relative and can be considered a function of risk exposure. In other words, both the severity and the frequency of adversity must be considered when assessing resilience. Fragelli & Günther also frame the relevance to associate the construct of resilience with cultural and religion values, as a specific combination of values will result the meaning of problems, distress and coping for members and their families. The use of self-report assessment measures of family systems in research, education, clinical counseling work, and particularly family health research is based on the premise that family processes interact with individual family members and psychological and physiological processes in discernible and predictable ways. Clearly, a family system is subject to interrelated environmental influences that can and do have a profound impact upon its individual family members. Although research has corroborated the interrelated influences among a family system, its members, and the environment, this field of study is still in its development. As an instrument intended to measure family functioning, The Family Indices of Regenerativity and Adaptation General (FIRA-G)was developed to cover important areas of the family system. To facilitate research on family systems, including the transitions, adjustments, and adaptations that occur within these systems as well as their impacts on family members, Mc Cubbin[16,17] developed a cluster of family measures designed to assess the critical dimensions and components of the family stress model. This series of research instruments is called the FIRA Series. These measures have demonstrated reliability and validity and can be used to test the major dimensions of the Resiliency Model of Family Stress, Adjustment, and Adaptation. The FIRA-G has been applied in the social sciences and health fields to emphasize medicine, psychology, and prevention. The utility of the instrument has been demonstrated in measuring resilience in individuals, families, and communities[15,18]. In Brazil, the lack of instruments to measure physical and psychological resilience in families justified the translation and cultural adaptation of the FIRA-G[8,19]. The purpose of this article was to evaluate the reliability of the FIRA-G to investigate the resilience of Brazilian families in a setting of vulnerability, in terms of substance abuse problems and economic social problems[1,21]. Accordingly, the resilience shall be considered as significant protective factor in such situations of vulnerability and may be an important part of prevention. A case control study was undertaken at a selective prevention centre for children and adolescents from families with substance misuses (CUIDA) and a Pediatric outpatient clinic of the public health care facility, in partnership with Federal University of São Paulo, Brazil. a) Case selection: The case group was defined according the inclusion criteria: just one child representing your family (even with siblings) and one of the parents (the father) with a confirmed of alcohol abuse by Family CAGE test and who were accompanied by a caregiver at the selective prevention service. The exclusion criteria were children of addicted mothers and children without the presence of parents or accompanied by a care giver at the selective prevention service. According this criteria 31 participants were excluded, 14 (45.2%) had an addiction mothers and, 17 (54.8%) more than one son in the family. b) Control selection: The control group was selected according the inclusion criteria: one child per family without a history of family addiction. The exclusion criterion was children without the presence of parents or accompanied by a caregiver at the Pediatric Outpatient. The Brazilian Economic Classification Criteria, a socioeconomic rating system that evaluates the purchasing power of urban families and individuals. The ANEP criteria classify the population according to the total points scored on the measure’s items. The higher the score, the higher the family’s social class. Social classes are divided as follows: Class E (0 to 19 points); Class D (20 to 34 points); Class C (35 to 58 points); Class B (59 to 88 points); Class A (89 points or more). Class A represents the most-favored social stratum, and Class E represents the least-favored social stratum. The Family Index of Regeneration and General Adaptation (FIRA-G) it was developed by McCubbin and provides a set of evaluation of the Resiliency Model of Family Stress, Adjustment and Adaptation. This instrument measures seven indices of family functioning: Family Stressors Family Strains, Relative and Friend Support Index, Support Index, Family Coping- Coherence, Family Hardiness and Family Distress Index. Data collection: The FIRA-G was translated by two researchers with good command of the English language, resulting in two translations that were each tested with a group of ten families (5 families with alcohol-dependent fathers and 5 families with drug-dependent fathers) to determine which form would be understood most easily by subjects. This process resulted in a second draft of the translated FIRA-G. This version was administered to another group of ten families, who were asked to explain what the questions meant as well as to answer them. The goal was to determine whether the families and the interviewer agreed on what the questions actually meant. A third version of the questionnaire was presented to an ad hoc committee composed of a Brazilian psychologist field with a good understanding of English, a Brazilian native who did not speak English, an English psychiatrist who was fluent in Portuguese, and an English psychologist with some understanding of Portuguese. All of the committee members worked in the field of addiction. The committee examined both the original English questions and their Portuguese translations. Eventually, consensus was reached as to which version of each question was most easily understood by the average Brazilian patient while maintaining the original meaning of the question. The ad hoc committee’s version of the questionnaire was administered to another group of families (5 families with alcohol-dependent fathers and 5 families with drug-dependent fathers). The aim was for each family member to provide his/her understanding of the questions and to answer them. These interviews were taped. Minor modifications to the questions were made after each interview and before the final draft. The back-translation was performed by an American English teacher without reference to the original version of the questionnaire. Data analysis: Descriptive analyses were performed using the Statistical Package for the Social Sciences (SPSS v17.0, Chicago, IL, USA). To assess the internal consistency of the indices that make up the FIRA-G, Cronbach’s alpha coefficient was used. To understand the associations between the groups and their socio-demographic profiles, the Chi-square test and Fisher’s test were used. A between-groups analysis of variance (ANOVA) was used to compare the mean ages of the children in the groups. All participants gave written informed consent, and their anonymity was guaranteed. The study design was approved by the Human Research Ethics Committee of the Federal University of Sao Paulo - School of Medicine (protocol no. 917/99). Family: Of the 305 families evaluated, 71% (n = 214) lived below the poverty line (class D or E). There were no significant differences between the socioeconomic statuses. Of the 305 families, 52% (n = 158) of the fathers and 50.5% (n = 154) of the mothers had less than nine years of schooling. The mean parental age was 38 years (M = 15.7; SD = 11.6). Of the 305 fathers, 43% (n = 132) were Caucasian, 45% (136) were multiethnic, and 12% (n = 37) were Black. Of the 305 mothers, 53% (n = 161) were Caucasian, 39% (n = 119) were multiethnic, and 8% (n = 25) were Black. Most of the fathers had manual labor jobs, and most of the mothers worked as housecleaners or housekeepers; 52% (n = 158) of the fathers and 50.5% (n = 154) of the mothers had not completed elementary school. This outcomes (Table 1) are supported by results in Table 1 from Payá, Giustti, Saccani, Mastandréa & Figlie and in Table 1.1 from Payá, Santoro, Vieira & Figlie. Table 1: Demographic data related to the families and children under study (n = 305). Note: Chi-square test or **Fisher’s exact test p-values; F test (ANOVA) p - value for mean comparisons - *p < .05. **p < .01. The FIRA-G comprises seven indices designed to measure aspects of family functioning. For each of the Brazilian Portuguese indices, the internal consistency among the items was evaluated using Cronbach’salpha. Cronbach’s alpha was also used to measure the reliability of the factors. Table 2 shows the reliability values for the Portuguese and English versions of the indices. Cronbach’s alpha for the family resilience construct was 0.65, which implies adequate robustness. The Family Strains Index showed an internal consistency value equal to that of the original scale (.69). The reliabilities of the original Family Distress and Family Stressor indices have not been established; however, the reliabilities of the Portuguese versions were .60 and .47, respectively. The Portuguese version of the Family Coping-Coherence index showed poor internal consistency (.47) relative to the original version (.71). The Relative and Friend Support, Family Hardiness, and Social Support indices showed reliabilities of .76, .69, and .65 respectively. Table 2: FIGA-G: Reliability measures between both Versions (English and Portuguese) (n = 305). Note: *Not found in the English Version of The FIRA-G scale. Table 3: FIRA-G – Family Index of Regenerativity and Adaptation-General the according with Groups and ANOVA. (n = 305). Note: The means (1), (2) and (3) are different at a significance level of 5%. Resilience was measured using the seven indices of family functioning (Table 3). There were differences between groups on the Family Strains (t = 24.4; p < .000), Total Resilience (t = 12.7; p < .0001), Family Hardiness (t = 13.2; p < .000), and Family Distress (t = 50.5; p < .000) indices. For all but the Family Hardiness index, the averages of the study groups were higher than those of the control group. For the Family Strains index, the averages for the groups of children whose parents were alcohol (M = 14.7; SD = 10.3) or drug-dependent (M = 13.3; SD = 7.9) were similar, and they were both higher than that of the control group (p < .000). The drug-dependent group had the highest average score (p < .000) on the Family Hardness index (M = 16.4; SD = 8.7), followed by the alcohol-dependent group (M = 15; SD = 8.3). On the Family Coping-Coherence index, the children of alcohol-dependent parents (M = 15.8; SD = 1.7) and the controls (M = 15.9; SD = 1.5) showed similar averages that were higher (t = 3.16; p < .000) than the value for the children of drug-dependent parents (M = 15.2; SD = 1.8). On the Family Hardiness Index, the control group had the highest average (M = 43.6; SD = 7.8), followed by the alcohol (M = 41; SD = 8.7) and drug groups (M = 35.7; SD = 10.4). Differences on the Resilience Total Index were observed only between the control group (M = 20.8; SD = 11.8) and the alcohol group (M = 29.6; SD = 16). No other differences were found among the groups on the other indices. Although there were no significant differences on the Social Support Index (t = 0.52; p = 0.837), the drug group (M = 63.2; SD = 10.4) had less social support compared with the alcohol (M = 64.2; SD = 9.7) and control groups (M = 64.7; SD = 8) (see Table 3 on p. 24). Gathering information on the functions and characteristics of family systems involved in substance abuse helps us to explore alternatives for strengthening and changing family behaviors. Investigating family resilience not only supports abroad understanding of the family system, which is capable of change and coping with difficulties, but also underlines the need to include specific tools for developing positive family attributes in the field of clinical and communitarian interventions. Pursuant to the above mentioned goals, the relationship between the indices of the Brazilian version of the FIRA-G and the demographic data are discussed below. Concerning the demographic data of the sample, 71% (n = 214) of the 305 families evaluated were characterized as part of the D or E economic classes, although socioeconomic profile is not, in and of itself, a determining factor in substance abuse. A low-income family does not necessarily have dependence-related or violence-related problems. However, according to q, low income creates a more vulnerable environment for family members. As factors associated with much greater vulnerability are identified, a stronger association with resilience is found among families. In addition, the environment in which the sample population lived is a potential source of vulnerability. The Jardim Angela community is a conglomerate of slums located in the southern region of Sao Paulo, Brazil. According to Laranjeira and Hinkly, this area had the highest alcohol outlet density reported in the literature in 2002. In the late 1990s, the United Nations (UN) ranked this area as the most violent neighborhood in the world, with 120 homicides per 100,000 inhabitants. The impact of the diverse situations experienced by each group of families was evidenced by the resilience results. Families that had an alcohol-dependent member were more resilient than families that had no problems with substance abuse. The type of substance abused affects the resilience of families differently and leads to different consequences for the children of addicts. A previous study[8,9], found that the children of drug-addicted parents are more vulnerable than the children of alcohol-dependent parents to developing risky behavior. It is logical to think of family resilience as an important protective factor that is likely to contribute to reducing the damage of substance misuse for children of alcohol-abusing parents compared to children of drug-abusing parents. The Family Stressors Index consists of 10 items that record life events and changes that can render a family vulnerable to the impact of a subsequent stressor or change. Such life events include the addition of a new family member, a change in a family member’s work situation, and the illness or death of a family member. The alpha value for the Brazilian version of this index was .47. The alpha value of this index has not been identified for the original version. However, the low value for the Brazilian version was unexpected because the life events and changes included in the index were reported as frequently occurring in the lives of the family members surveyed. Paya, Giustti, Saccani, Mastrandea & Figlie reported that for the same sample, the stress arising from involvement with police, death in the family, and financial difficulties was an important risk factor associated with the increased vulnerability of the children of drug abusers as well as with the problem of addiction. It is essential to recognize that this sample was influenced by a high level of stress. The families in this sample have been exposed to events leading to further social vulnerability, such as misery, unemployment of parents, criminality, and domestic violence. This was the reality for the control group as well. The Family Strains Index consists of 10 items that record life events and changes that can render a family vulnerable to the impact of a subsequent stressor or change. The index includes conflicts between a husband and wife, conflicts among and between children and their parents, financial hardship, and the strain of caring for an ill family member. Cronbach’s alpha for both the Brazilian and the original version of the Family Strains Index was .69. The sensitivity of the instrument reveals the effects of recurrent traumatic events on the lives of families, including instances of domestic violence and recurring situations of aggression between family members[2,3,9]. Despite the lack of a common definition for the word “vulnerable”, correlations have been found between having one or more family members who abuse alcohol or drugs and high levels of parental conflict and violence within a family, low-quality relationships, and serious economic problems[1,21]. The Relative and Friend Support Index consists of 8 items that record the degree to which families call upon relatives and friends for support. The Relative and Friend Support Index (original version) had a Cronbach’s alpha of .82. The Brazilian Family Stressors Index had an alpha of 0.76, a good level of sensitivity for this index. Social factors were highlighted as important protective factors for the sample studied. The more support that was provided by friends and relatives, the more resilient the family was. This aspect may well contribute to the exploration of possible strategies for strengthening and changing family behaviors[5,6]. The Social Support Index consists of 17 items that record the degree to which families are integrated into the community, view the community as a source of support, and feel that the community can provide emotional and social support. The Social Support Index had a Cronbach’s alpha of 82. Support and social support were highlighted as important protective factors for the studied sample. Resilient families had more social support; parents in families with alcohol problems were more resilient than families with drug-abusing parents. Although Cronbach’s alpha for this index was 0.65 for the Brazilian version, it is remarkable that involvement with illicit substances as well as other risk factors, such as aggression, marital conflict, and domestic violence, are themselves risk factors for social support because they involve moral or emotional features such as shame, fear, exposure, and family secrecy. Thus, it would be expected that these families would avail themselves of family support rather than turning to the community. The Family Coping-Coherence index consists of 4 items that evaluate the degree to which families call upon their coping skills to manage stressful life events, strains, and changes. This index includes the acceptance of stressful events, the acceptance of difficulties, the positive assessment of a problem, and faith in God. The original Family Coping-Coherence index had a Cronbach’s alpha of .71, whereas the Brazilian version of this index had an alpha of .47. This low value may indicate a limited understanding of the issues that constitute coping mechanisms. This index is associated with aspects of acceptance and resignation by a family toward substance abuse. The literature suggests that these issues should be associated with the values and the cultural and religious beliefs of the communities of the families interviewed. Although several studies suggest a positive correlation between religious affiliation and greater life satisfaction, hope, optimism, and marriage stability as well as decreased rates of anxiety, depression, and substance abuse, religious belief in this sample needs to be understood as whether one maintains faith in relation to relatives’ changes. In this sample, 64, 30% (n = 196) of those interviewed practiced a religion, 17% had at least some sort of religious connection, and only 18, 70% were truly agnostic (p = .2). It is also important to note that adversity and the “family coping-coherence” condition are subjective concepts. As found in previous studies both of these concepts are viewed as absolute, but they are dependent on one’s perspective. Thus, the ambiguity of the experience of adversity and family members’ ability to cope with addiction problems must be considered in family research. The Family Hardiness Index was developed to measure stress resistance and adaptation resources in families, which function as buffers or mediating factors to mitigate the effects of stressors and demands and facilitate family adjustment and adaptation over time. Family hardiness specifically refers to the internal strengths and durability of the family unit and is characterized by a sense of control over the outcomes of life events and hardships. Cronbach’s alpha was .82 for the original Family Hardiness Index and .69 for the Brazilian version, showing good sensitivity. The Family Distress index consists of five items that record major family difficulties that may deteriorate family stability. The index targets family members with emotional problems, abuse of alcohol or drugs, and psychological violence as well as separation, deterioration of a marital relationship, or divorce. Cronbach’s alpha for the original version of the Family Distress index has not been identified, but it was .60 for the Brazilian version. The index focuses on traumatic experiences that deteriorate family life. It is important to emphasize, as mentioned previously, that these subjectively viewed situations may be recognized as either trivial or extreme problems by family members. According to Gethin, Trimingham, Chang, Farrell, & Ross, families who live with addiction inevitably face stressful situations, but they have different ways of dealing with or reacting to stressful events. Some limitations must be taken into account when judging the validity of our data. The characteristics of the sample may have affected their understanding of the instrument due to their heightened level of vulnerability. The education level of the interviewed caregivers may also have affected their understanding. From the seven indices of the FIRA-G scale were translated into Brazilian Portuguese, five of them (Family Strains, Relative and Friend Support, Social Support, Family Hardiness, and Family Distress) were sufficiently sensitive to identify differences between the investigated groups(alcohol/drug abuse and control). Although the other two (Family Stressors and Family Coping-Coherence) showed lower sensitivity. It is noteworthy to note that the alpha values for Family Distress and Family Stressors were not identified in the original version. Therefore, these two lower outcomes should also be understood in terms of the characteristics of the sample. The high level of vulnerability that these families experience may have affected their understanding of the instrument. It was concluded as an initial study of the Portuguese version of the FIRA-G scale that it is worth emphasizing the importance of conducting further studies to investigate the factor analytic structure of the scale and including samples with different social conditions in the analysis. Once instruments that measure family functioning are essential for planning interventions. Moreover, the FIRA-G scale is capable of comparing resilience between groups, but the findings suggest that based on the methodology used, the scale is not a reliable instrument to measure components present in the construct of family resilience within this sample. Hence, further studies to assess samples living in different social conditions should be conducted with the Brazilian FIRA-G scale. 1. Foshee, V.A., Reyes, H.L.M., Ennett, S.T. (2012). Assessing the effects of families for safe dates, a family-based teen dating abuse prevention program. JAH 51(4): 349-356. 2. Rabello, P.M., Caldas, J.A.F. Violence against women, family cohesion and drugs. (2007) Rev Saude Publica 41(6): 970-978. 3. Zanoti-Jeronymo, D.V., Carvalho, A.M. Self-concept, academic performance and behavioral evaluation of the children of alcoholic parents. (2005) Rev Bras Psiquiatr 27(3): 233-236. 4. Loukas, A., Zucker, R.A., Fitzgerald, H.E., et al. Developmental trajectories of disruptive behavior problems among sons of alcoholics: effects of parent psychopathology, family conflict, and child under control. (2003) J Abnormal Psychol 112(1): 119-131. 5. Liddle, H.A. Treating adolescent substance abuse using Multidimensional Family Therapy. (2010) In J. Weisz & Kazdin A (Eds.) Evidence-based psychotherapies for children and adolescents N.Y Guilford Press 416-432. 7. Jordan, S. The promotion of resilience and protective factors in children of alcoholics and drug addicts. (2010) Bundesgesundheitsblatt Gesundheitsforschung Gesundheitsschutz 53(4): 340-346. 8. Payá, R., Giustti, B., Saccani, A.P., et al. Children of substance abusing parents: Child behavior data of Brazilian service. (2015) J Addiction Prevention 3(2): 6. 9. Paya, R., Santoro, L.S., Vieira, D.L., et al. Logistic regression to assess risk factors in offspring from Brazilian families with alcohol and drug problems. (2015) Int Arch of Addict Res Med 1(1). 10. Chasson, G.S., Carpenter, A., Ewing, J., et al. Empowering families to help a loved one with Hoarding Disorder: Pilot study of Family-As-Motivators training. (2014) Behav Res Ther 63: 9-16. 11. Riggs, A.S., Riggs, D.S. Risk and resilience in military families experiencing deployment: The role of the family attachment network. (2011) J Fam Psychol 25(5): 675-687. 12. Rutter, M. Resilience, competence, and coping. (2007) Child Abuse and Negl 31(3): 205-209. 13. Castleden, M., McKee, M., Murray, V., et al. Resilience thinking in health protection. (2011) J Public Health 33(3): 369-377. 14. Rutter, M. Implications of resilience concepts for scientific understanding. (2006) Ann N YAcad of Sci 1094: 1-12. 15. Fragelli, T.B.O., Günther, I.A. A promoção de saúde na perspectiva social ecológica [Health promotion from the social ecological perspective]. (2012) Revista Brasileira em Promoção da Saúde 21(2): 151-158. 16. McCubbin, H.I., F.I.R.A.G Family Index of Regenerativity and Adaptation-General. In McCubbin HI, Thompson AI. (Eds. ), Family assessment inventories for research and practice (FAIRP) (pp. 292-312). (1991) Madison, WI: The University of Wisconsin-Madison. 17. McCubbin, H.I., Thompson, A.I., McCubbin, M.A. Family assessment: Resilience, coping and adaptation: Inventories for research and practice. (1996) Madison, Wis: University of Wisconsin Publishers. 18. Murray, J., Anselmi, L., Gallo, E.A.G., et al. Epidemiology of childhood conduct problems in Brazil: systematic review and meta-analysis. (2013) Soc Psychiatry Psychiatr Epidemiology 48(10): 1527-1538. 19. Pesce, R.P., Assis, S.G., Avanci, J.Q., et al. Adaptação Transcultural, confiabilidade e validade da escala de resiliência (Cross-cultural adaptation, reliability and validity of the resilience scale). (2005) Caderno de Saúde Pública 21(2): 436-48. 20. Laranjeira, R., Hinkly, D. Avaliação da densidade de pontos de venda de álcool e sua relação com a violência (Evaluation of alcohol outlet density and its relation with violence). (2002) Revista de Saúde Pública 36(4): 455-461. 21. Lemstra, M., Bennett, N., Nannapaneni, U., et al. A systematic review of school-based marijuana and alcohol prevention programs targeting adolescents aged 10-15. (2010) Addict Res Theory 18(1): 84-96. 22. Frank, S.H., Graham, A.V., Zyzanski, S.J., et al. Use of the family CAGE in screening for alcohol problems in primary care. (1992) Arch Fam Med 1(2): 209-216. 23. Koenig, H.G. Religion and medicine IV: Religion, physical health, and clinical implications. (2001) Int J Psychiatry Med 31(3): 321-336. 24. Gethin, A., Trimingham, T., Chang, T., et al. Coping with problematic drug use in the family: An evaluation of the Stepping Stones program. (2015) Drug and Alcohol Review 35(4).